Is there any character in the history of cinema that typifies America’s anti-communist feelings more than Ivan Drago? The dude was an emotionless wall of impenetrable muscle backed up by Soviet science who wasn’t just pleased with knocking his opponents out in the boxing ring; he wanted to kill them. Of course, Drago didn’t earn his size and strength legitimately—he was seen receiving injections of what appeared to be steroids in the movie, which led audiences to believe that he was basically a science experiment that the Soviet Union used to flex its muscle on the world stage. Rocky, on the other hand, was 100% American-made muscle, who worked out and dieted vigorously, earning his glory without resorting to artificial means. There is no way to deny that bit of propaganda. 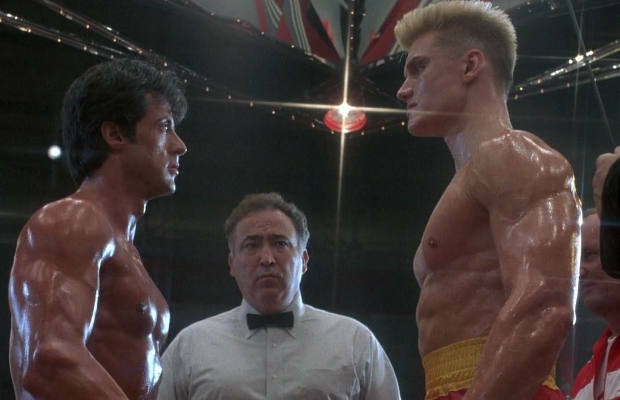 But Drago’s Soviet physique couldn't help him from getting pounded by Rocky in true red, white, and blue fashion, in what amounted to America’s most impressive feat of the entire Cold War.